Off to America on holiday today. The big blow before heading off: discovering a big ding in the crossbar of the Raven. Seems it took a tumble inside and the crossbar hit the corner going up the stairs. Seems entirely unreasonable to have suffered such damage considering that it's meant to be a bomb-proof expedition bike. I emailed Robin Thorn (proprietor of the shop that made it), who was reasonably encouraging. He replied right away, saying that it's almost certainly still safe to ride, and that if I send photos he'll let me know about repair or replacement. I'm in favour of the latter, of course, and I hope they can do it for free! Not holding my breath on that one, though. I love loading up my bike for utilitarian purposes. 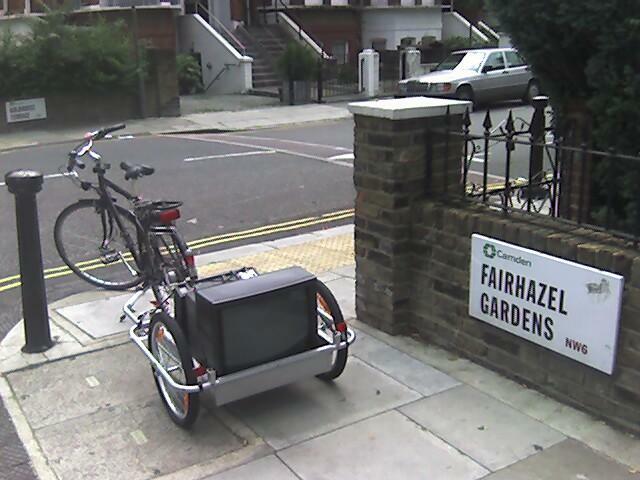 Whether I'm muling stuff to storage or taking cardboard to Westminster for recycling (because Camden won't do it at its neighbourhood recycling stations), I take great satisfaction in loading up my rack and/or trailer and heading off. So today, I had a bunch of stuff to take away - the old telly (14 years, not bad! Samsung before they started to design their products), and months worth of paper to recycle. The telly had to go to the main recycling depot in Kentish town (where they do take cardboard, but it's usually not worth the trip), and the papers just down the street. I started by taking the child enclosure off the trailer (I just hope I'll be able to get it back on again). Then I bungeed the tv and a broken vcr into it, and set off up the hill towards Kentinsh Town. Of course, I had to cross the Finchley Road at the top of the hill, which is where I ran into a little problem. I've used the trailer lots of times, always being sure to leave enough room on either side. Not this time, though! I was crossing the busy road and my left tire hit the island, and over it went. Speaks well of the trailer that I stayed upright, but the tv was face down on the southbound side of one of the busiest roads in North London. With the help of a sympathetic passer by, I got the tv back in the trailer and dragged the whole assembly to the island. I had to make the hard choice between blocking the way for crossing peds and sticking out into traffic, and I chose the former, and was told off by an old lady for it. Turned out that the power cord from the tv wound round one of my axles too, which complicated matters. In the end, I disconnected the trailer from the bike and took both pieces across the road, where I hooked back up and reloaded the trailer, and I was off again. Taking it slow (and careful, this time), I was at the Regis Rd recycling place in about 20 minutes, having attracted lots of attention and comments along the way. Mostly incredulous and amused, except for at the dump itself, where people tended to be impressed and interested. The papers got to our local recycling station without incident.